I would now like to add the event time and venue to the Map View., instead of the address. How do I do that? Hi. Are you wanting to customize the map’s pin/tooltip content or the list of events below it? Hope that helps point you in the right direction. Please let me know how this goes for you. I would then be able to remove the city from the event title, which was a clumsy workaround! The extension is designed to display all events at a single venue. It accomplishes this by customizing the pin’s text. You can reference its codebase as a starting point, but I cannot assist you further toward your desired customizations. If you need some coding help, you may want to ask your own developer or reference our Customizations Documentation, which includes a link to Hire A Freelancer. We tweaked the tribe-events-ajax-maps.js file to help you and other customers who might want to customize the map tooltip in the future. Here’s the new extension file. Please note that for now, this is an unofficial extension. 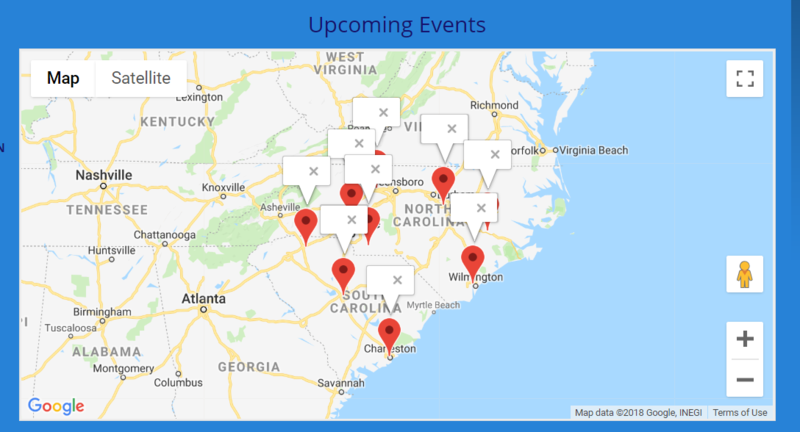 The code here was modified based on existing .js file in the “Display all events with the same venue in the map tooltip” extension and is keeping this functionality as well. 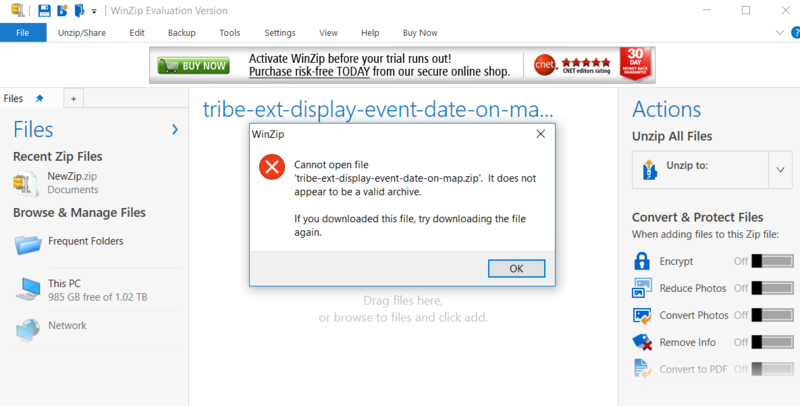 “The package could not be installed. PCLZIP_ERR_BAD_FORMAT (-10) : Unable to find End of Central Dir Record signature” What went wrong? Hi. Patricia’s .zip file worked just fine for me. I can’t unzip it! See screenshot of results from Win-Zip. Is there a better program I could use for un-zipping? I read through your article on Manual Plugin Installation, and have a question: where to find my FTP program? I unzipped it…using 3rd program! Have read all articles on FTP uploads…but that will have to wait until after Florence. Expecting high winds soon. So, if you don’t hear from me, it’s not because I’ve lost interest…just lost power or Internet access…lol! Patricia’s extension has been installed and activated on the staging site. I tried it, but nothing has changed. Does it have to be configured? If so, where? Sorry you’ve struggled so much with this. You shouldn’t have both of those Map View extensions (the two listed alongside each other in your wp-admin plugins list). Your Map View not displaying is usually fixed by re-saving your Permalinks at wp-admin > Settings > Permalinks. I deactivated the “Display Multiple Events…” extension, re-saved the Permalinks as instructed. The result is in screenshot below. It looks like you deactivated the wrong one. If you still need assistance with this, please re-share your System Information in a Private Reply. Thank you. I did some more testing and confirmed an issue with this extension and asked Patricia to get back to it when she can. For now, we’ll need to wait based on her availability. Once it’s ready again, I’ll use my credentials to try it again.